Making vacation plans and getting ready to stoke your wanderlust have been scientifically proven to improve health. The largest boost in happiness comes from the simple act of planning a journey. Nearly 4 out of 5 domestic trips – that is 79 percent – are taken for leisure purposes, according to the U.S. Travel Association. Since you are already traveling and spending money, why not explore new destinations with your family and embark on adventures that you can afford so you don’t have to wait too long to save money and have fun again. If only money could grow on trees, you’d be off right now. But traveling on a budget takes planning. With some research you can still enjoy trendy cities, crazy adventures in remote areas, breathtaking scenery and delicious food without breaking the bank. 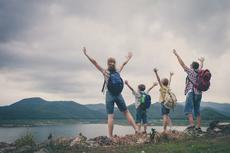 Take the kids on a trip around town to find interesting places they may have never seen before; make the most of the strong dollar nowadays and go on a fun road trip together away from technology; camping in national parks, hiking surrounded by gorgeous backgrounds and horseback riding are also affordable options. You may be surprised to find out that amusements parks and cruises are not as expensive as you may think in the fall and offer plenty of discounts.